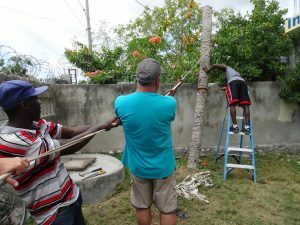 A team from the United States came to help after Hurricane Matthew and found minimal damage to the property and building at IIT Haiti. A tree in the front yard was damaged and had to be cut down. All of the computer laptops and other equipment were not damaged by the hurricane. Classes were able to continue a few months after the hurricane hit in October 2016.